I see you took the wise precaution to open a *TOPMOST* window, but since the intro crashed during the precalc, mr. computer needed a complete restart: congratulations. No crash for me but incredibly slow on my FX5900XT (0,5 fps). So, perhaps required PS3.0? or ATI only? Anyway, I saw it on demoscene TV : it deserves its 5th place. For me it's more a reinterpretation of mfx's "The Ballet Dancer". This high voltage transmissions line is a curious choice but is well animated. And the cables motion too! So I would have give it a thumb but no with this rendering inconveniences. I really love this one, great work! you _NEED_ d3dx9_24.dll in place to run this demo! the demo loads some d3dx9 functions at the end of the precalc screen. I have d3dx9_24.dll in system directory. It still crashes(no response) at precalc screen, though. Athlon64 3000+, 1g ram, Radeon X800(256m) w/ Catalyst 6.4(and 6.3), DirectX 9.0c installed(d3dx9_24.dll thru d3dx9_29.dll are also installed). added on the 2006-04-19 13:42:49 by AbcuG! this could have been SO much more. 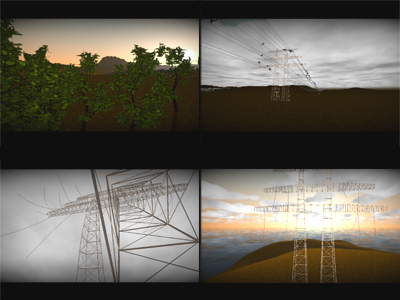 the idea of a power pole coming to live might not be new, but it was never used in a demo/intro before. first of, the visuals are superugly, the 3D flybies couldn't be more boring to watch, most of the chosen perspectives do not support the action and the power pole walking off (poorly animated) leads to nowhere ... if at least the visuals would look better (you did much better in the 4K compo), i'd be fine with the rest, but looking like this, it was a rather frustrating experience for me (considering its potential). sorry. i would have liked that thing to get in the town and to destroy everything!! :) Great one! What monroe said, but without the thumbdown. I still liked this. not that bad but obviously not that good either.. the direction was virtually non-existant and the music was cliched like no tomorrow. so much potential done the wrong way. I think this was the first demo I've seen that looked like it needed to go thru the 'how to make your demos look good on the bigscreen' bit a few times. There were parts where I could barely make out the powerlines, and other small subtle details that were obviously very important to the story. Because of that I cannot thumb up, as I spent more time going "why! why is this looking so CRAP!" than enjoying it, when it was obviously something I could have enjoyed. potentially breathtaking scenes for 64k somewhat ruined by poor choices in design and music. and yes, a little more gamma next time, please.